This is a fine old color example of the Laurie & Whittle edition of Lewis Evans' landmark map published from the Surveys of Evans, Thomas Walker and Christopher Gist, 1750-51. Evans’ map is considered one of the most important and influential maps of the British Colonies to be published in the eighteenth century, as are the maps of Henry Popple and John Mitchell. The map was used by General Braddock during the French and Indian War and later published by Benjamin Franklin in Philadelphia, in 1755. Eighteen states of the map have been documented, of which this is a so-called pirated edition published by Laurie & Whittle of London. The map was the first to depict oil in Pennsylvania, coal in Ohio, and the first to accurately map the trans-Appalachian and Ohio River region. Evans’ map is a landmark in the history of American Cartography which became the subject of numerous scholarly texts. 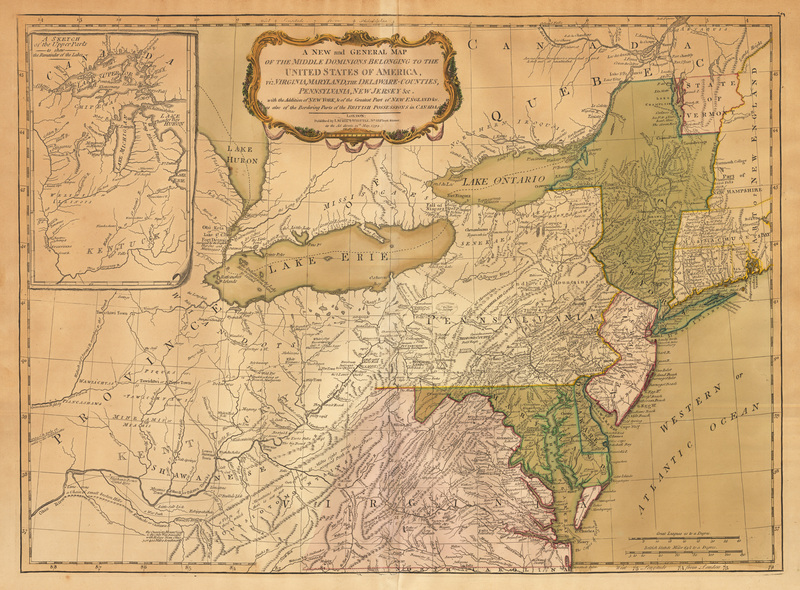 This is a 1794 version is a full original example of this important map, updated to reflect post-Revolutionary War details. Large inset of the region bounded by Lake Superior, the Mississippi and Alleghany Rivers. Condition: This map is in A condition. There is some uneven toning with slight stiffening of the paper.